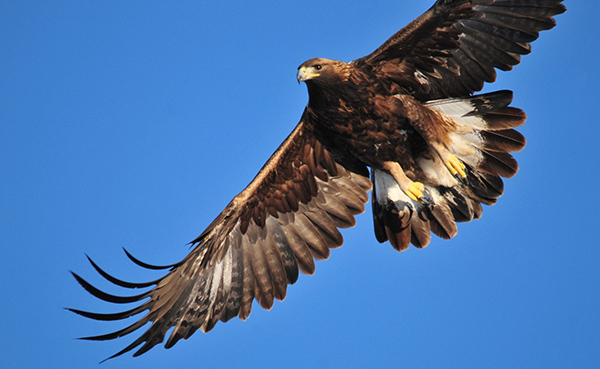 Golden eagles primarily hunt ground squirrels, jackrabbits, marmots and prairie dogs. But they have been observed killing badgers, bighorn sheep, bobcats, coyotes, cranes, deer, mountain goats, pronghorn, seals, domestic sheep and swans. While they mainly attack from above, they sometimes hunt on the ground, raiding nests, scavenging carrion, stealing food from other birds and occasionally catching fish. So, in November 2014, when one human hunter spotted a golden eagle that was obviously injured and stressed, he decided to help a fellow hunter out. 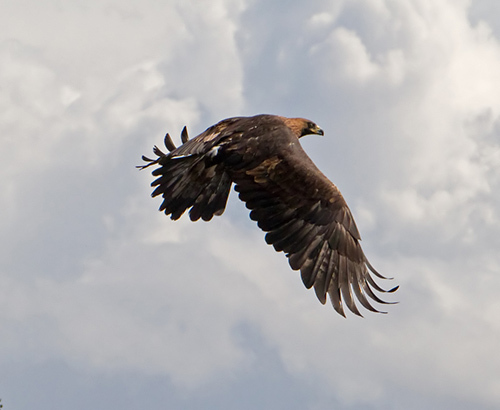 Some golden eagles migrate, but others do not. Alaskan and Canadian eagles typically fly south in the fall, while birds that live in the western continental U.S. tend to remain in their ranges year-round. Three years ago, Warren Johnson, who owns a Montana outfitting business, one of his guide employees and a client were headed into the Gallatin National Forest, located just north of Yellowstone National Park, in search of elk. 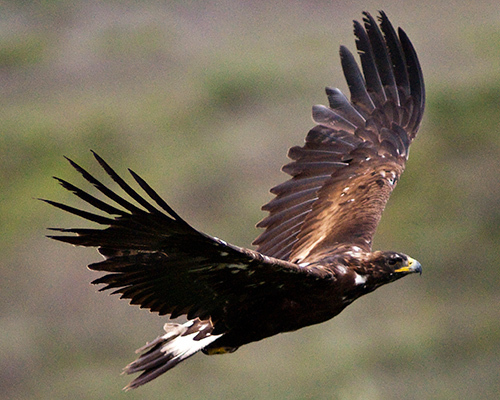 As they approached a herd, they spotted a female, juvenile golden eagle on the ground. At first, they assumed that she had been feeding on a carcass and was too full to fly. But as they watched her try to take off, they could see that one of her wings was hanging down. Two days later, Johnson went into the forest with one of his guides and another client. He spotted the grounded eagle again. Knowing that the area was accessible only by horseback or snowmobile and that this raptor had to be growing weaker, he decided it was time to intervene. He called a game warden at Montana Fish, Wildlife and Parks (FWP) and asked if the agency would be able to help the golden eagle if he could manage to capture it. The game warden said it could. Securing a very large and strong bird such as a golden eagle, however, proved harder than Johnson had estimated—especially in thigh-deep snow. Whenever he got close, the bird tried to lift off, but she only managed to flap farther down the steep hill where she had taken cover. With a seven-foot wingspan and razor-sharp talons that have the strength of a 1,000 pounds per square inch (compared to a human’s 100 pounds per square inch), she was a force not easily overcome. Capturing the bird by hand quickly became unfeasible. So, channeling his inner cowboy, Johnson managed to lasso her on his third try. To subdue her, the three men threw a coat over her, and Johnson then carried her out of the mountains on horseback. When he arrived at his ranch, he transferred the golden eagle to a dog crate, and a biologist from a local raptor rehabilitation center drove her to the wildlife hospital. She had a fractured left radius-ulna. As the 166th raptor admitted to the center in 2014, she was given the designation GE 166-14. Usually, the raptor center doesn’t encourage people to attempt the sort of rescue Johnson accomplished. If you come upon an injured bird or other animal in the backcountry, it’s best to contact the local office of the state fish and game agency and ask for the phone number of a nearby licensed wildlife rehabilitation center. In this special case, however, Johnson turned out to be an adept raptor wrangler. This golden eagle happened to be out in a place where not many people would have come across her. Without being able to fly and hunt, she would have perished. Both bald and golden eagles are federally protected under the Migratory Bird Treaty Act and the Bald and Golden Eagle Protection Act. 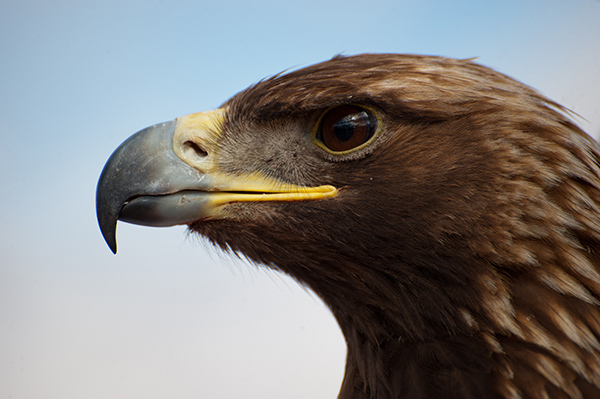 Nearly 70 percent of recorded golden eagle deaths are attributable to human impacts, either intentional or inadvertent: collisions with cars, wind turbines and other structures; electrocution from power lines; or poisoning from consuming bait intended to control nuisance animals or lead ammunition from gut piles and carcasses of animals shot by hunters. It turns out that Johnson is not only a principled hunter but an avid steward of natural places: he volunteers for FWP and forest service projects; spends two to three weeks each summer spraying toxic weeds in the forest to safeguard elk habitat; has packed beaver into the wilderness to establish colonies; and helped to relocate bighorn sheep as part of regional wildlife management efforts. GE 166-14’s wing healed after surgery, but the stress of it took a toll. In mid winter, she molted. The center continued her intensive physical therapy as her feathers regrew. Click on the video below, in which the hunting prowess of a golden eagle is showcased, although success is certainly never guaranteed. Then, check out the YouTube video found here, and watch as the man who lassoed GE 166-14 is given the honor of releasing her back into the wild. It’s a case of one hunter respecting another.